Let me start off by saying that yes, this post is ridiculously long. But guess what? 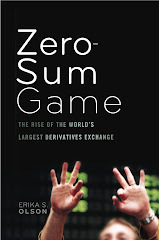 You have until February to finish reading it. I think the easiest way to tackle this two-hour episode is to start with the Jacob-centric scenes, move to the present-day Island events, follow those with the 1977 action, and then end with a bit of speculation about what could possibly happen in Season Six. Also, since I could write a full post about each of the little clues spread throughout the finale, I'm choosing instead to provide links where appropriate to web sites that offer greater detail about, say, the book Jacob was reading. Otherwise I'm never going to be able to finish this write-up. And now, let's begin at the beginning. Within the first few minutes of "The Incident," we were not only introduced to the long elusive Jacob (he's... just... a regular-looking dude? ), but we also got a much better glimpse of the four-toed statue. It became clear to me from the opening scene that this was going to be an extremely strange finale; the series had suddenly been swept into a new -- although not entirely unexpected -- context. Jacob and his mysterious adversary had some sort of long-running bet about the nature of mankind, and everyone who came to the Island (or, should I say, was lured to the Island by Jacob) unknowingly became part of this squabbling duo's experiment. MYSTERY MAN: I don't have to ask. You brought them here. Still trying to prove me wrong, aren't you? MYSTERY MAN: Am I? They come. They fight. They destroy. They corrupt. It always ends the same. The mystery man then proceeded to tell Jacob that he'd eventually find a "loophole" and kill him. And Jacob was like, "Bring it on." 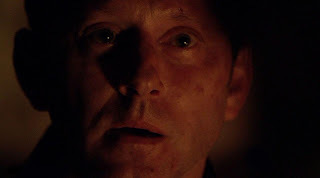 The first time I watched the finale, I automatically assumed that Jacob was "good" and the mystery man was "evil." It seemed to me that the mystery man believed people were inherently bad, while Jacob was intent on showing him that humans deserved a chance. Many of you wrote to me with the opinion that I should not jump to the conclusion that we can easily categorize either of these age-old beings. Perhaps they don't represent good versus evil or fate versus free will or science versus faith or anything that clear-cut. Upon watching the show again, I can definitely appreciate how some of you are hesitant to slap labels on these new characters. However, the practical side of me thinks that they do represent two distinct sides, because the "light versus dark" theme has raged throughout this series since the pilot episode, and so it would make sense if Jacob and his adversary were the physical representations of this theme. This series needs to be wrapped up in seventeen more hours, and I think that when everything is said and done, it must be clear to the average viewer what Jacob and his adversary stand for (as in, one of them must be "the bad guy" and one of them must be "the good guy"). But does the fact that Jacob was wearing a white shirt automatically mean he's not the villain? No. 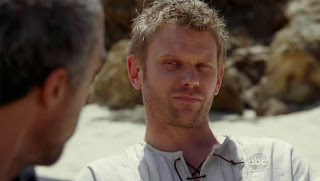 On my second viewing, I couldn't help but wonder if what I originally perceived to be evilness was actually just the mystery man's frustration with Jacob for messing with people's lives -- if perhaps he was more sympathetic to those who were reeled in to the Island, and knew that the only way to spare others in the future was to kill Jacob. When Jacob was revealed to be the man offering to pay for the lunchbox Little Kate swiped, I got chills. I thought that we would then see a bunch of flashbacks in which Jacob interacted with the Lostaways when they were kids, and that we could therefore conclude that he somehow drew all of them onto Oceanic 815. 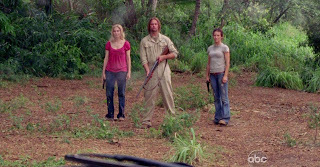 But that's not exactly what happened -- Jacob visited both Hurley and Sayid after 815 but pre-Ajira 316. So what other reason could there be for these encounters? - When Little Kate stole the New Kids (Joey McIntyre 4EVA!) lunchbox, Jacob was there to prevent the shop owner from calling her parents and the police. He then gave her a little tap on the nose as he told her to "be good." So was he trying to set her on a straight and narrow path for the future... or was he subtly sending her the message that she could get away with doing bad things and evading the law? - Little Sawyer was in the process of writing his vengeful note to the man he would later spend a good part of his adult life trying to hunt down and murder... but then his pen ran out. Jacob handed him another so that he could keep on scribbling. 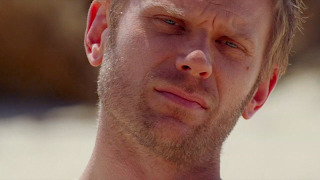 Was he trying to encourage James' quest to kill The Real Sawyer? - Jacob called Sayid back from the intersection where Nadia was hit. 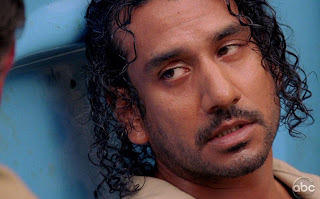 Did he save Sayid from also being struck? 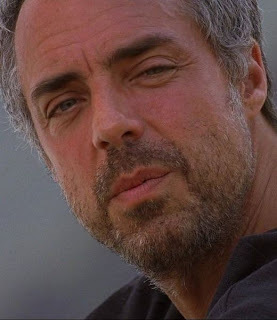 Or did he actually orchestrate Nadia's murder in order to put Sayid on the path of working for Ben? 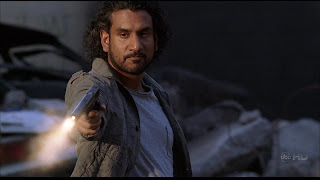 On a related note, I found it extremely interesting that in the recap episode ("A Journey in Time") which aired prior to the finale, the producers stated that "Sayid 'believed' he was assassinating Widmore's men" while he was in cahoots with Mr. Linus. Notice how they used the word "believed" -- it makes me question whether it was really Widmore's associates that Sayid was offing. (I picked up on this because last year Carlton said that Sun was "consumed with grief because she believed Jin was dead" -- that was a little hint that Jin wasn't gone for good). 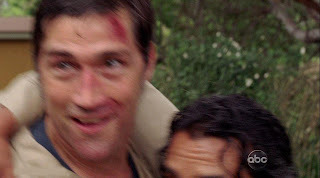 So now I think there's a chance that the people Sayid killed were actually decoys set up by Jacob, and that even Ben had been fooled into thinking they worked for Widmore. The fact that Ilana was the one to trap Sayid and that she knew about the man he killed at the golf course supports this theory (now that we've seen Jacob ask Ilana to "help" him). - Right before Locke had his eight-story fall, Jacob was just chillin' on a park bench nearby, reading Flannery O'Connor's Everything That Rises Must Converge. Once Locke landed with a sickening thud, Jacob calmly walked over to him, put his hand on John's shoulder, and said, "I'm sorry this happened to you." I'm in the camp that believes Locke had been dead until Jacob did his thing. Unlike the previous three flashbacks, nothing about this interaction struck me as dastardly. - The same can be said for Jacob's time with Jin and Sun. He showed up at their wedding, emphasized how they should never take their love for granted (in perfect Korean), and then disappeared into the crowd. - Next came Jack -- he had the quickest encounter... simply receiving an Apollo bar from Jacob (immediately following the harrowing surgery he described to Kate in the pilot episode -- kind of cool to get to see that). - Finally, Hurley got his visit. After he was released from prison, just a day before Ajira 316 departed, Hurley shared a cab with Jacob and was the only 815 survivor to have a bit of a chat with the enigmatic man. Jacob reassured Hurley that he was not crazy, and that he should look at his ability to see and speak with his dead friends as a blessing. Before he got out of the cab, Jacob made it clear that returning to the Island was Hurley's choice. 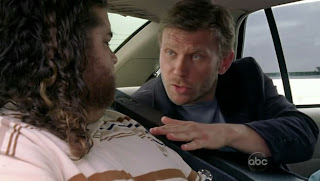 And even though Jacob claimed the guitar case wasn't his, it was surely put there by him to remind Hurley of Charlie... and hopefully nudge Hurley into showing up at the airport. The majority of Jacob's interactions with the Lostaways lead me to believe that my initial hunch about Jacob was right -- he's "the good guy." 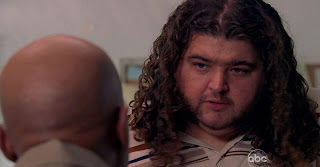 His talk with Hurley was what really helped convince me that Jacob's not out to ruin anyone's life -- he's a proponent of free will, and hopes that the people he visited will make the right decisions in their lives. 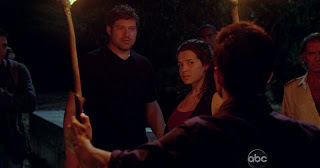 There's no obvious connection between any of Jacob's visits, except for the fact that all of the people were on Flight 815 (duh)... and that he physically touched Jack, Kate, Sawyer, Sayid, Hurley, Locke, Jin and Sun. By doing so, I can only assume that Jacob transferred some sort of power to them... or -- perhaps like the mutant Rogue from X-Men -- took a bit of their essence and/or memories for himself. Since Locke seemed to be revived after Jacob came to him, though, I'd say it's probably the former. But how will Jacob's encounters with the 815ers affect things going forward? And how did he know to visit those specific people at those exact times in the first place? I'll attempt to provide answers to the above questions at the end of this post. First, it's time to review all of the bad stuff that went down in the present-day on the Island. 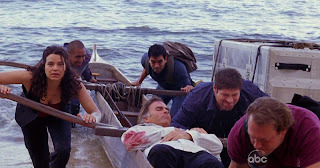 This finale did not show us who was involved in the outrigger shoot-out against the time-travelers; add that to the heaping pile of Mysteries To Be Resolved In 2010. Instead, Bram, Ilana, a few other randoms and Lapidus safely made it to the shore of the main Island with their huge metal crate in tow. Both Bram and Ilana tried to reassure Frank that he was with "the good guys," but I don't blame our favorite pilot for remaining suspicious. I also wonder what they consider him to possibly be "a candidate" for -- my only guess at this point would be a member of the army they might need to call upon in the upcoming Island war. Anyway, after showing Frank what was in the crate, the group took off for Jacob's cabin. Since we saw a flashback of Jacob visiting Ilana and asking her to help him, we can assume that this group is on Jacob's "side" (and not part of a Dharma resurgence, like I originally believed). Did you see how Jacob wore gloves when he talked to Ilana in the hospital? More proof that when he touches people, something happens. I'm very curious to know how Ilana ended up in the heavily bandaged state she was in when Jacob talked to her, but obviously that answer's going to have to wait until next year, too. In the meantime, we know that once Ilana rummaged around in the cabin, she quickly came to the conclusion that Jacob hadn't been there for a while, and that someone else had been using the dilapidated shelter. The group was going to have to keep looking for their leader, but at least he'd left a clue: a drawing of the statue. So Ilana and crew headed out to Taweret, but Locke, Ben, Sun, Richard and the Others had a big head start. After a quick rest stop at the 815ers old camp (so glad Sun found Charlie's ring! And so hoping that her doing so was meant to foreshadow the return of the Island's most celebrated rock god...) and a few more snarky exchanges between Locke and Ben, Richard finally led the Others to the four-toed statue and informed Locke that Jacob could be found inside. After a weak attempt to stop Locke from bringing Ben along, Richard helped the two men find the secret entrance, and then stepped aside. Shortly thereafter, Ilana's group finally caught up to Richard and showed him what was in the crate. The lyrics below pretty much sum up my reaction. After Richard told Ilana that what lies in the shadow of the statue was "Ille qui nos omnes servabit," or "he who will protect/save us all," I started to get the sinking feeling that I wasn't going to be happy when I saw what Bram and his buddies had been hauling around the jungle. As I don't think we have been given any reason to believe that Richard is "bad" per se, and since Ilana specifically asked for him by his presumably old old name (Ricardus), meaning that she might have known or heard about him way back in the day, I extend my "probably not bad" assumption to her and her small group (especially since Richard told the Others not to attack). Which would mean that Jacob -- their ultimate boss -- is also good. 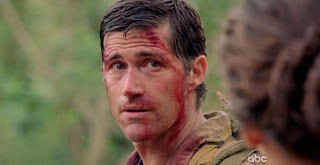 And because we knew Locke's intentions were to have Ben kill Jacob... and since Locke had definitely been acting stranger and stranger after he returned to the Island, I braced myself to see him roll out of the crate. And that's what happened. 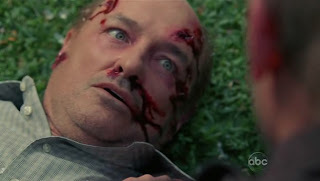 Real Locke was dead, and had been that way ever since Ben strangled him at the end of "The Life and Death of Jeremy Bentham" (making my memories of running across filming for this episode in Oahu very bittersweet). Once Ajira 316 landed on Hydra Island, the mystery man had taken on Locke's form. I realize now that there didn't have to be a clone of Locke's body in order for this to happen (unlike what I assumed in my Initial Reactions post)... Mystery Man could've just shapeshifted into a Locke lookalike. You know, just like we've seen Smokey do several times before. So does that mean Mystery Man is also Smokey? I'm not totally sure, but I'm definitely leaning toward that explanation. Smokey had an encounter with Locke just a few days after Oceanic 815 crashed. At that point in time, it most likely scanned his mind (like we've seen it do with other characters) and came to the conclusion that this was not only a "good" person, but one who was easily manipulated. If Mystery Man is Smokey, he might have hatched his plan of how to use Locke as a pawn in his fight against Jacob right at that moment. 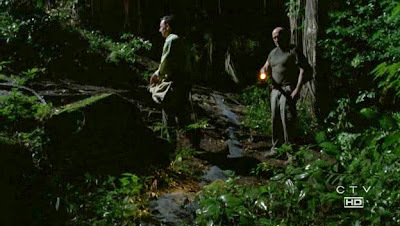 Whatever Locke saw that "was beautiful" when he looked at Smokey might have been a fake vision of him triumphantly leading everyone on the Island, or some other similar scene that would convince him that it was his destiny to be there and that he needed to heed whatever signals the Island sent him. We've watched Smokey take the form of Yemi (Eko's brother) and Alex, and can assume that he's also masqueraded as Christian Shepherd and possibly even Claire. Since we know Yemi's body was badly deteriorated in the drug plane yet Yemi appeared to Eko as Eko remembered him, it's clear that Smokey does not need an actual body to do his shapeshifting. Once Ajira 316 touched down on Hydra, Smokey could've easily noted how Locke looked in his coffin and then assumed his form from that point on. 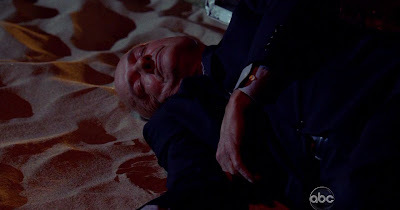 In retrospect, the monster's arrival in the underground chamber with Ben in "Dead is Dead" -- perfectly timed with Locke's comings and goings from that same area -- was another hint about what was really going on. I just couldn't bring myself to accept it at the time. So yes, I've processed the fact that Real Locke as we've come to know him is dead. 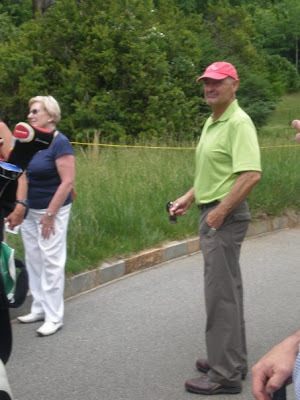 And as Long Live Locke reader Will P (who spent half the day golfing with Terry O'Quinn two days after the finale aired) sent me this article in which Terry himself voices his belief that Locke is a goner, I'm positive that my favorite character won't be around at the outset of Season Six (Not Locke doesn't count). I don't think he's going to be resurrected, either. But I do think we'll see Real Locke again -- somehow, some way -- over the course of the remaining seventeen hours in the series. More on that later. For now, we need to finish off the present-day scenes with the showdown at the statue. 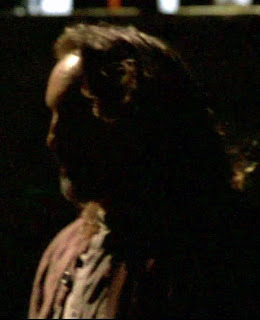 After Locke and Ben entered the chamber (the same one in which Jacob was getting his weave on at the beginning of the episode), Ben wandered around the room and took a look at the tapestry before both men were startled by Jacob's voice. Color me just as surprised as Ben was when Jacob peeked out from behind a column, still human in appearance. Since we saw (or thought we saw) Jacob in weird spirit-like forms in the cabin in seasons past, I'd assumed that something had happened to him along the way that turned him into a helpless ghost. But there he was, standing in front of the fire pit, fully aware that Locke wasn't really Locke at all, but rather his old rival who had finally found a "loophole." 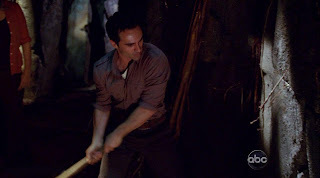 The loophole must have been for Mystery Man to either manipulate someone else into killing Jacob, or to specifically get the leader of the Others to do the deed. As Real Locke was dead, Ben was the de facto leader. Ben was thoroughly shocked to finally come face to face with the man he'd been been taking orders from throughout the years -- so much so that he almost forgot why he was asked to tag along in the first place... until Not Locke reminded him. BEN: Oh... so now, after all this time, you've decided to stop ignoring me. Thirty-five years I lived on this island, and all I ever heard was your name over and over. Richard would bring me your instructions--all those slips of paper, all those lists--and I never questioned anything. I did as I was told. But when I dared to ask to see you myself, I was told, "You have to wait. You have to be patient." But when he asked to see you? He gets marched straight up here as if he was Moses. So... why him? Hmm? What was it that was so wrong with me? What about me?!? Jacob's response to Ben was definitely the "Oh no he didn't!" moment of the night. Talk about the wrong thing to say, huh? 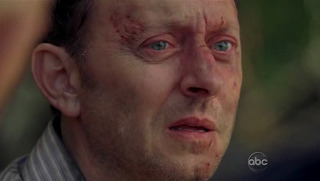 I truly felt for Ben during his speech -- it was yet another brilliant display of Michael Emerson's immense talent. I should be hating his character with the passion of a thousand blazing suns now that I know he is responsible for Locke's death, yet I still pitied him. Ben is completely alone, having lost everything he ever loved to the Island. To come to the realization that he was just a nobody in the whole scheme of things was simply too much for him to bear. And so, he carried out Not Locke's plan by stabbing Jacob in the heart. Any doubt I had about Mystery Man/Not Locke being evil was totally removed once he kicked Jacob into the fire. 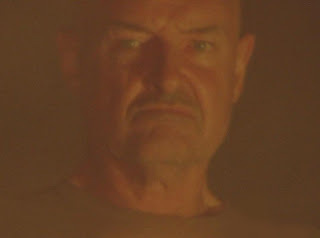 The look on Not Locke's face while he watched his enemy burn was just chilling -- I almost expected devil horns and a tail to sprout right then and there. You'd think that Not Locke would've at least cracked a smile or allowed himself a few seconds of celebration after the moment he'd been waiting hundreds of years for finally came to pass. But Jacob's final words -- "They're coming" -- seemed to disturb him deeply. Most people believe that "they" are the 815ers who Jacob touched in the past, and I agree. Another plausible option is Ilana and her people, even though right now there only appear to be about five of them. Regardless of who "they" are, what exactly is Mystery Man's plan to fend them off, now that Jacob is seemingly dead? I mean, what's his ultimate objective? Is he going to kill everyone because he just wants to live on the Island by himself? Is he going to turn everyone into his own personal slaves? Could he possibly manipulate the Others into thinking that he is truly their leader, now that they've all seen Dead Locke? Was he trying to change or stop the events of a time loop and is still in danger of that not happening? I'm kind of at a loss for what Mystery Man's next move is going to be or what he's trying to achieve overall. But since Widmore warned Real Locke that a war was coming to the Island, I can only assume that killing Jacob isn't the only thing Mystery Man needs to do in order to "win." Whatever this war is about, it's undoubtedly going to be epic in scale -- an event that Mystery Man has been plotting his entire life to bring about. I'm not completely done talking about the present-day scenes and what they might mean for Season Six, but since the time-traveling 815ers are obviously also critical to how the show will progress, let's review what happened to them in this episode before trying to pull everything together. I SAID YOU WANNA BE STARTIN' SOMETHIN'? On the submarine, Kate informed Sawyer and Juliet of Jack's plan to nuke the Island. 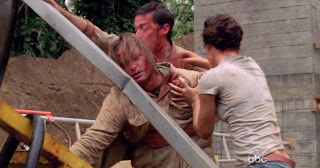 However, Sawyer held firm to his decision to continue on to the "real world"... until Juliet assaulted one of the sub's crewmen and arranged for the trio's escape. And escape they did, right to the beach where Bernard, Rose and Vincent had been enjoying "retirement" for the past three years. Others think that the Nadlers are still very much alive, but that we probably won't see them again on the show until it's discovered that they are the Adam and Eve skeletons. I'm not buying this, though, because Jack had said that the skeletons looked to have been there for 40 to 50 years, and even if Rose and Bernard died immediately (perhaps because of The Incident), that would still only leave 30 years before Jack and Kate find their remains in a cave in 2004. Plus, I think we'll see whomever the skeletons belong to alive and with the black and white stones before the series is over. So the debate about Adam and Eve rages on... as does the talk about whether or not we'll ever get to hear any of Rose and Bernard's witticisms again. If we stop trying to figure out what will become of the dentist and his wife for a second, however, what's left is a scene about two people very much in love, who can't figure out why their fellow survivors keep raising hell all over the Island. Can you blame them for not wanting to get involved? Over at (or should I say under?) Dharmaville, Sayid disassembled the bomb according to Faraday's instructions while Richard asked Jack about his old nemesis, Locke. 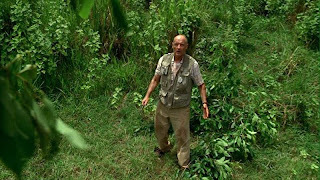 RICHARD: Over twenty years ago, a man named John Locke, he walked right into our camp. And he told me that he was going to be our leader. Now I've gone off the Island three times, to visit him. But he never seemed particularly special to me. JACK: Yeah. Yeah, I know him. And if I were you, I wouldn't give up on him. Now that Locke's fate has been revealed, Richard's words support the idea that the ex-box company employee was never special -- he was simply a pawn in a game between Jacob and the Mystery Man... a gullible loser with delusions of grandeur who was easily manipulated by wilier minds. Jack's words, however, provide a glimmer of hope that Locke's life did (or does) mean something important in the grand scheme of things, and that perhaps his story isn't completely over. 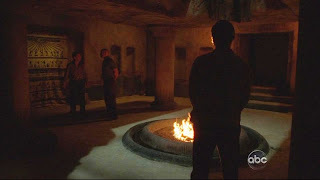 After Sayid had the bomb's reactor in hand, the foursome traveled further along the underground tunnels until they reached the area near Horace's house. Richard hammered through the wall... and then knocked Ellie out and announced that the two 815ers were on their own. Two things I wish we had learned from Richard before he left were: 1) how exactly did the Hostiles get the 20-ton Jughead underground in the first place? and 2) why was he OK with letting these yahoos potentially nuke the whole Island? Was he certain that they'd fail, or was he somehow positive that none of his people would be hurt? It doesn't seem like "because Ellie approved of it" is a very strong reason. But then again, Richard followed all of Locke's demands even though he didn't like them, so maybe his "adviser" role prohibits him from disobeying the current leader. Roger got Sayid right in the gut, and then Jack had to attempt to lead his injured friend through a hailstorm of bullets. Things looked pretty darn bleak for our compadres until Hurley saved the day once again with his Dharma Van Driving Skillz. Did you catch the quick smile Jack flashed when he saw who had pulled up in the nick of time? It was very cute, I must say. The van didn't get too far before it was blocked by the submarine escapees. Jack and Sawyer decided they were going to settle their differences the old fashioned way through a knock-down, drag-out brawl. You already know from my other finale post that I wasn't a fan of the love quadrangle's decision-making processes in this episode. Each of them seemed to have pretty shaky reasoning for doing what they did. The most puzzling was Kate, who had been completely against Jack's plan to erase their pasts... but then when the time came for him to literally drop the bomb, she was all of a sudden OK with it (and she hadn't even heard his true reasons for doing so). 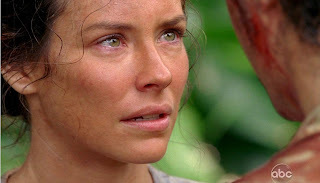 If Kate was just going to go along with what Jack wanted to do, why did she leave him in the jungle in the first place? Oh, yeah, because the writers needed a way to get Sawyer and Juliet back on the Island. Before you accuse me of being a cold-hearted, unsentimental fool who can't comprehend the power of love, let me assure you that I have absolutely no issue with Jack realizing that he wanted a second chance with Kate. And I get how Juliet must have felt when she realized that she just wasn't meant to be with Sawyer... just like I get how Sawyer wasn't going to fight with his woman once it was clear she'd made up her mind about letting Jack follow through with his plans. My issue isn't with their feelings, it's with when and how the writers chose to have these characters express their feelings -- namely, in ways that could potentially destroy the lives of hundreds of other people. In "Follow the Leader" -- which took place just hours before "The Incident" -- Jack basically told Kate that the vast majority of the past three years had been "misery." During that conversation in Ellie's tent, he had a chance to admit he screwed up their relationship and that he didn't want to lose her forever; she was practically begging him to tell her that their time together hadn't been a waste. But instead he let her believe that he was OK with erasing their memories of each other. 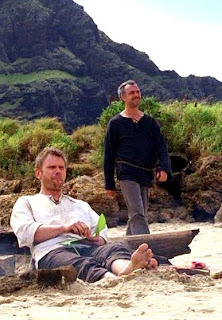 Yet shortly thereafter he goes and tells Sawyer (not Kate) that he's following Faraday's instructions in the hopes of getting another try with Kate, and then proceeds to do something that he knows will probably kill everyone remaining on the Island. Whatever happened to "Do no harm"? Anyway, I'm not going to moan on and on about how I didn't like everyone's flip-flopping, because the only thing that matters is that in the end, they were all on the same page. They wanted Jughead to have its way with them and were willing to suffer the consequences of whatever transpired as a result -- be that death, erasing three years of their lives, or something else. Before Jack could do his thing, however, Radzinsky was wreaking some havoc of his own down in the Swan's construction pit. The guy really is mental, isn't he? Even if he truly believed that his work was going to "change the world," what's the harm in taking a few deep breaths and listening to Chang's warnings? But nooooo, Radzinsky was all "drill, baby, drill!" and sure enough, the electromagnetic pocket was pierced. I don't know exactly what I was expecting The Incident to look like, but I was impressed with what I saw... it was similar to what happened when Locke destroyed the Countdown Timer o' Doom in the hatch... times ten million. Jeeps were dragged across the ground, towers crumbled, tools and weapons flew through the air -- it was mass chaos. And of course, Phil did not survive. Which death by arrow was better -- his or Frogurt's? 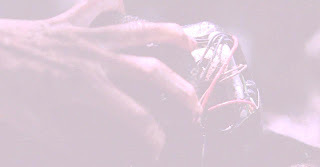 We also saw Chang's hand get smashed in the collapsing machinery, just like we expected it would (as he had a prosthetic arm in some of the orientation videos). Luckily, Miles was there to save dear ol' dad from a much worse fate -- I thought that was a nice touch. 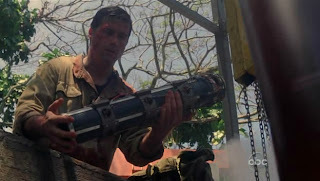 During the commotion, Jack successfully threw Jughead's core down into the shaft. Sayid had supposedly rigged it to detonate upon impact... but nothing happened. Nada. Zip. Zilch. 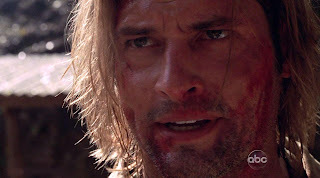 I absolutely loved the insanely tense few seconds where everyone braced for an explosion... and then when it became clear that the plan had failed, Sawyer quipped, "This don't look like LAX." However, bomb or no bomb, the magnetic force was still sweeping anything and everything metal into the crater, and Juliet found herself entangled in a huge chain. As soon as I saw that, I almost couldn't bear to keep watching the television screen. I knew that she would be dragged into the pit, I knew that Sawyer would grab hold and try to pull her back up, I knew that Kate would tried her damnedest to help, and I knew that it would be all for naught. Awful, awful, awful. But at the same time, this really was a wonderfully touching scene, and both Elizabeth Mitchell and Josh Holloway brought it. I couldn't reach for the Kleenex fast enough, that's for sure. 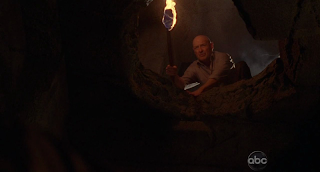 Remember back in "This Place is Death" when I was so crushed by how Sawyer frantically started digging at the spot where Locke had disappeared down the well? This was like that... times twenty million. SUPPOSE I NEVER EVER MET YOU? SUPPOSE WE NEVER FELL IN LOVE? 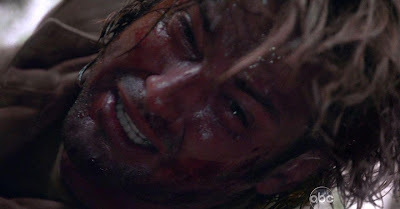 When Juliet explained to Sawyer why she wanted Jack to go through with Faraday's plan, she said, "If I never meet you, then I never have to lose you." Well, lo and behold, in the final scene of the season, we got to see that Juliet was not kidding around. Above ground, Kate and Jack were tearing a grief-stricken Sawyer away from gaping hole that was still sucking in dangerous chunks of metal, while down, down, down at the very bottom of the pit, Juliet suddenly regained consciousness. We're never going to get an explanation for this, so I'm going with "the Island wanted her to detonate the bomb." Because let's face it, it's highly unlikely she would have otherwise survived that fall if the Island didn't have a purpose for her once she reached the bottom. Whether or not the Island intervened, if Juliet wasn't convinced that Jack's plan was going to work, I don't think she would've started banging on the detonator. Why? Because even though she probably realized she was a goner, she wouldn't have wanted to chance anyone else getting blown to smithereens. So she would've only tried to make the bomb explode if she truly believed that it would erase the past three years and give everyone a second chance -- even if she still died in the process. Therefore, she grabbed a rock and went to town on Jughead's core in the hopes of giving her man and his fellow survivors a "do-over" beginning in 2004. After eight tries, an explosion was heard as the screen faded to the first-ever white end title screen. And then... we all realized that we hadn't exhaled for the past few minutes. First things first -- is there any way that Juliet could've survived the blast if it did not work like Faraday assumed it would (meaning that the past three years did not reset)? I sincerely hope so, but when I watched the episode again I noticed that her lower half appeared to be crushed underneath a ton of metal and she definitely seemed to be in a pretty bad state. What makes this all so much worse is that none of the other characters will ever know about her brave act. So here's to hoping that something in the timeline does change and we get to see a happy, healthy Juliet again at some point in Season Six. One last comment before I attempt to start throwing out some grand, all-encompassing theories: The bomb did detonate. There was some debate about this early on, but I replayed the end and you can definitely hear an explosion. What's less clear is what effect the bomb will have on the 815ers, the Island and the overall timeline. So without further ado, allow me to try and figure out how what we learned in the last two hours of Season Five might shape Lost's final (sniff) seventeen episodes. 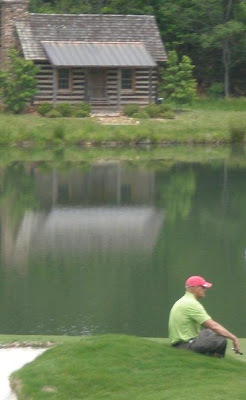 You know all those times we thought we caught glimpses of Jacob in the cabin -- an eye here, an old dude in a rocking chair there? The joke was on us; I don't think that was Jacob at all. Ilana believed her leader hadn't been in the cabin for "some time"... and I have a hunch that "some time" is probably more than three years. Maybe Jacob did putter around in the rickety shack at one point, but he'd probably returned to the statue before 2004 rolled around. 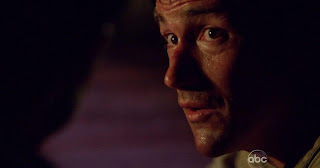 Therefore, I'm betting that Mystery Man was behind all of the weirdness that Ben, Locke and Hurley witnessed in the cabin on different occasions. My guess is that something caused Mystery Man to lose his human form quite a while ago. He dissolved into a bizarre spirit-y state and was held captive (by Jacob or Jacob's people) in the cabin thanks to a magical circle of ash. Somewhere along the line, the circle was broken -- either intentionally or on accident. 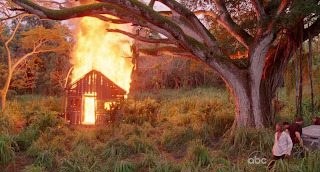 If it wasn't Mystery Man's spirit in the cabin, or if it was him but he wasn't able to get out because there wasn't a break in the ash by the time 815 crashed, then I remain totally confused about everything having to do with what we've seen go down in the cabin, and would also be less confident about Mystery Man doubling as Smokey. So let's just assume that the ring of ash had been broken by September 2004. Then what we'd have is the essence of Mystery Man running all around the Island, being able to take the form of any corpse he came across. That may be the reason the Others chose to cremate their dead out at sea (remember how Jack witnessed this at Colleen's funeral in "The Cost of Living" when everyone was all dressed in white?) -- they'd started seeing their loved ones reappear and realized it wasn't a good idea to bury anyone on the Island. So back to the cabin... when Locke was able to hear "Jacob" and Ben wasn't, it was really all part of the elaborate ruse that Mystery Man had been working on for quite some time. He needed Locke to feel special... and he needed Ben to be insanely jealous. 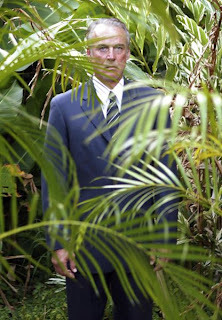 MYSTERY MAN: ... It always ends the same. I'm interpreting this bit of dialogue to mean that there is indeed a time loop -- that these two supernatural beings have seen some span of time play out over and over and over again. Mystery Man is annoyed because Jacob keeps holding out hope that either a) humankind isn't going to destroy the planet when it's all said and done or b) a specific, shorter period of time that keeps looping will one day have a better outcome. I'm not sure if it really matters how long the loop is; I think the most important thing is that the Lostaways are clearly critical -- in Jacob's mind -- to changing things for the better. As he's seen the entire span of time, he knew exactly when it might help for him to pop into certain characters' lives and subtly influence their decision-making. He didn't lead them to be on Oceanic 815... he visited them because he already knew that they were on Oceanic 815 -- it's another chicken/egg situation. But Jacob must not have liked the original outcome of events. Or perhaps he was certain that the "original" outcome of events was tainted because Mystery Man had manipulated certain people, and that's why he had to step in and try to provide a counterbalance. The result was Jacob and his adversary both trying their hardest to make the ultimate "ending" support their personal beliefs about mankind. They want to prove each other wrong, but the ultimate winner will be decided by the Lostaways' actions. Which leads right back to the Whatever Happened, Happened debate. Mystery Man finds his loophole in the form of Dead Locke and manipulates Ben into killing Jacob, but at the exact same time thirty years prior, Juliet detonates Jughead. So did all of this already happen, or did Ms. Burke blast the whole crew into a new timeline? Something tells me that the events of 1977 didn't change anything at all. Miles had it right -- setting off the bomb was The Incident. The Swan is still going to be built over that spot. Flight 815 is still going to crash. And Juliet's actions will most likely send her time-traveling friends back to the present day, which is something that also probably happened in that exact same manner countless times before. The past three years will remain intact for everybody. BUT that doesn't mean all hope is lost for our beloved characters as they (probably) careen back to the future only to end up in the middle of the Island battle to end all battles. Like I stated earlier, Not Locke sure seemed concerned when Jacob said "They're coming." This leads me to believe that the benevolent loom-master anticipated his own murder and prepared a "Plan B" of sorts as a last-ditch effort to defeat his centuries-old adversary, and I'm pretty sure that part of that plan involved him making physical contact with all of the time-traveling 815ers. Perhaps the magical powers of the Island will transfer over to them now that Jacob has died. Perhaps they'll be safe from whatever nonsense Mystery Man tries to pull next. I really have no easily explainable ideas for what Jacob might have planned for our Lostaways, but my gut tells me that he was a smart fellow and had no intention of going down without a fight. The fact that he pretty much just stood there when Ben stabbed him supports my belief that he knew this scenario had to play out. Think about it this way -- what if the part of the time loop Jacob wanted to change is something that hasn't happened yet... something after the end of 2007? What if it's something that's left up to the 815ers to handle in Jacob's absence next season? The theory above is part of the reason why I believe that we haven't necessarily seen the end of dear old Locke; I can't accept that Jacob saved him after his paralyzing fall only to set him up as a pawn for the enemy with no further purpose. (And -- I swear to you -- I would still feel the same way if any of the other major characters had rolled out of the crate.) We now have several months to think through the possible ways the last seventeen hours of the show could play out, but there's one thing that won't be happening over the hiatus: a name change for this blog! ROSE [upon seeing Kate, Juliet and Sawyer on the beach]: Oh, hell no. 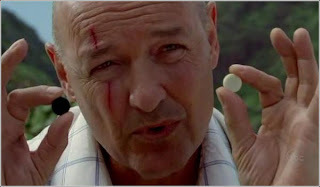 LOCKE: Do you mind if I ask you a question? JAIL CLERK [discharging Hurley]: One wallet. $227 cash. One ballpoint pen. One fruit roll-up. Sign here. JACK [as he passes by Juliet and Sawyer on his way to the Swan site with the bomb]: See you in Los Angeles. SAWYER [after the bomb failed to detonate]: This don't look like LAX. 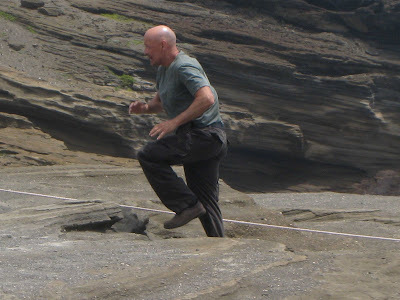 Next we have a shot of Terry O'Quinn bounding up the rocks while on break during the finale shoot. Ed Kos, owner of Kos Hummer Tours (you know, the marvelous tour I wrote two posts about last fall) was able to see Terry, Michael Emerson (Ben), Yunjin Kim (Sun) and Nestor Carbonell (Richard) that day. Does he have the best luck or what? The rest of the pictures in this section brought a smile to my face and prevented a full-on depression over Locke's death from sinking in. 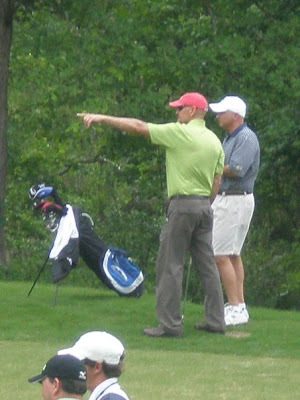 First we have Terry on the first day of the BMW Charity Pro-AM in South Carolina. Reader Will P was lucky enough to spend a ton of time with him (only two days after the finale aired) and sent along these awesome photos. 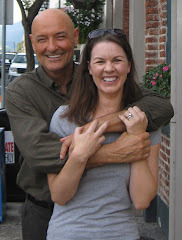 The next day, reader Brooke B caught Terry at the same event and graciously shared her wonderful pictures. He looks alive and well to me, folks! Here's hoping we can say the same thing about Locke before the credits roll on the final episode of the series. Believe it or not (though if you've read my site for any length of time, I'm sure you believe it), there's a lot more I could've said about "The Incident." However, I had to draw the line somewhere, and decided to save the rest of my commentary for another time. My plan for the hiatus is to start by giving myself a break from all things Lost for the next few months. I have literally thousands of messages from you guys to reply to and I've felt awful about neglecting those emails... so if you've written me this year and never heard back, please know that I'm going to try to respond -- starting with the poor souls who contacted me at the outset of the season in January. As for Long Live Locke... I'll probably post here again in early August, once I've had a chance to absorb whatever comes out of Comic-Con. So be sure to check back then... or, you can friend me on Facebook and/or follow me on Twitter, where I'll be sure to provide updates on my plans every once in awhile. I also hope you'll follow my movie-related posts over at redblog -- I usually publish two pieces a day and would love to hear from some of you over on that site (if you didn't know that I write for national DVD retailer redbox, check out my post about getting the gig here). Finally, I do plan to get According to e rolling again over the next few weeks, too. Posted by Erika (aka "e") at 7:23 PM 102 comment(s) from my peeps!